Do I want to find a place that serves reasonable priced healthy food on the go? Yes! Panera Bread has been billing itself as the “real food” alternative to the other places that I will not mention (but you know who they are). Panera is a fast casual restaurant serves soups, sandwiches, coffee and pastries and I want to like the place. For example, instead of chips you can choose an apple as a side for your sandwich – hurray! 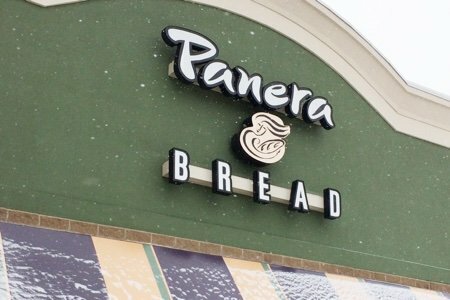 But, there are some large issues with their menu that might be deceptive for consumers who aren’t sitting around reading Panera’s nutrition facts because they have nothing else to do. Since I love to read nutrition facts – I have noticed a couple of major issues. 1. Their whole grain bread isn’t 100% whole grain. The first ingredient is regular old white flour. Real food (to me) means 100% whole grain and no white flour in a bread that is advertised as “whole grain”. 2. Their healthier options can have a ridiculous amount of sodium. For example a bowl of low-fat vegetarian black bean soup has 1120 mg of sodium. Are you kidding me? A Big Mac has 970 mg of sodium making it look good compared to the low-fat black bean soup if you are watching your sodium. It is hard to make a Big Mac look good. 3. They sell TWO over 1000 calorie sandwiches – the Steak and White Cheddar Panini and the Italian Combo Sandwich on Ciabatta. Real food can also be interpreted as “good for you” and I can tell you right now that eating a 1000 calorie sandwich is not good for you. Maybe half would be okay (but I’m not sure). I suppose my message is that in the world of fast casual you have to order VERY carefully to eat healthily. You may feel better about yourself because you chose Panera over McDonald’s but the real test is what you order. You can do better at McDonald’s with their salads (dressing on the side) and even the Big Mac if your penchant is to order the Steak and Cheddar Panini. What do you think of Panera? Please share. Can You Eat Bread and Lose Weight? find this company has An extremely overpriced menu an oversized servings. I went the first time about two weeks ago with my grandson we had a sandwich and I had a bowl of soup. The soup was salty the broth was thin and our bill came to $27 for two sandwiches and one bowl of soup! I would have been better off at Subways! Honestly, I am a bit tired of your putting down places---yes, there are some unhealthy options---there are everywhere, but at least they are trying---if you don't like their options, then don't go. Thank you for keeping us so well informed! Some people just take things for face value and it's good that we have people like you that dig deeper and tell us the truth! I appreciate you continuing to bring these things to light. The only way to get these companies to change is to hold them accountable. I think in terms of marketing, all restaurants have to have a variety of food to fit a lot of different lifestyles. If you are someone who typically goes to McDonalds and orders a Big Mac, then yeah, a 1,000 calorie steak and cheese panini may STILL be healthier. But if you're consciously watching your weight and sodium and living a healthy lifestyle, skip the panini and get a salad. After all, we are each responsible for our own bodies. I think if you are sick of her putting down places you could also simply chose to not read that blog. She's snack girl.. It's her job to bring reality to people. We read these articles when we have quite minutes to our selves and then remember what we have learned through out our busy days. And unfortunately. .I doubt they are trying. No franchise actually cares about your health. If they wanted to make stuff low sodium they could make it right there in their in there in the restaurant instead of it being sent in already made.. The companies can more than afford that. But instead of it being made fresh..they are more concerned with it being loaded junk to make it "taste good" so ppl want it more and more. So thank you snack girl, for pointing out what we may not have know about places who lie to us in order to boost their sales. Thank you for all your post. .I share your articles with my whole family because health and good choices is actually important to us. So I appreciate you having our backs! I find even their salads are a bit light on protein and a bit heavy on sodium...Panera is only a place I'll go if there's just no other choice. Too many tempting pastries right up front and in my face while I'm wrestling with their menus posted on the wall. If I can, I'll go sit down some where and order from a menu...OR if I'm out for a treat...coffee and a pastry can be worthy...but otherwise, not my first choice. Panera as with all restaurants has choices that are better or worse than others. I always check the menu anywhere I go and preferably before I go. One thing about Panera Bread that you need to know is you can order something the way you want it. I always order my breakfast without bread in a bowl...roasted turkey, spinach, red pepper, egg whites and a splash of pesto. Filling and low in points. I'm still here trying to figure out what your role as Snack Girl would be if you didn't keep us informed. I think you would be unemployed if you didn't report the good and the bad. I don't look at it as you are putting places down, I take the stance that you are giving us a little insight into things we may not know. Ultimately, we make the choices. I reaaly appreciate all the hard work you do and hope you keep doing your job as Snack Girl. There is a Five Guys next to our Panera so I never go in there. Five Guys is a total weakness for me so I try to avoid the place totally. I'll start out thinking "Apple salad" and end up with a small cheeseburger and bag'o fries. I have asked Panera several times about adding less salt to their soups. I also had to take my cup of soup back to the staff since the soup had just too,too much salt. People can add more salt if the soup is not to their liking. I also would like to see restaurants not add salt to the French fries they serve. We always request that no salt or no extra salt be added to our food at the restaurantsame we visit. We also ask for sauces to be served on the side. I appreciate you addressing the sodium and whole grain issues here, but wish you had made a few recommendations for what you WOULD order from their menu. Although it's good to have all the facts, I think there is some personal responsibility that falls to the consumer. Nutrition facts are always available if one wants to look them up and there are plenty of good choices. Panera was one of the first restaurants to list the calories of all their products on their menu, which I really appreciate. You mentioned salads at McDonalds but failed to mention the large selection of excellent salads available at Panera as well. Any large chain is going to have a certain amount of processed foods which means too much sodium. I'm guessing unless you eat fast food every day it's not a major problem for most people. From what I've read, Panera is an excellent company that contributes a lot back to society. That is very important to me when I'm choosing where to eat.I'd pick Panera over McDonald's any day. I frequent Panera often and it is still a land mine. First, their dressings are mostly high in fat so I order mine with no dressing and I carry my own balsamic vinegar. Also, the soups are almost always cream based which are very high in fat. I like the veggie pesto but they don't have it everyday. I usually get the french onion with no bread or cheese. So basically onion broth but it is high in sodium. It would be nice if Panera added more whole grains, less sodium, lowfat dressings maybe ones that are yogurt based and more soups that are not cream based. This would definitely be a step towards making Panera a more healthy option!! Watch out for their bagels, too...Cinnamon crunch has 430 calories and 32 grams of sugar! I love Panera! I usually get a pick two option of a salad (love their strawberry one that should be out soon) and a half of a flatbread sandwich. I may only eat the salad OR the sandwich and then treat myself to baked potato chips. I usually am not tempted by the desserts. I will agree that their prices are high but still go there two-three times a month. I have complained about these same issues to my husband when we are on a road trip looking for a quick place to stop. To make matters worse sometimes when I ask for the nutrition information they are "out" or "can't find it. " One even needs to be careful with the salads as some of them have too much sodium or have too much protein and calories. Who really needs chicken, cheese, and fried sweetened nuts in the same salad? You would think that with all the healthy foods Whole Foods markets sell that is making them a highly successful company, the huge increase in popularity of farmer's markets, and how major grocery chains (including, who would guess, Target! ) are adding huge organic sections so they aren't left behind in the dust, restaurants would get the message. After all, as a previous poster mentioned, you can always add salt. Restaurants could save a lot of money not addind all that salt.